Following the launch of Aeolus on August 22, this satellite’s instrument has been turned on and is now emitting pulses of ultraviolet light from its laser, which is fundamental to measuring Earth’s wind — and this mission has also already returned a tantalizing glimpse of the data it will provide. Following the launch of Aeolus on August 22, this satellite is emitting pulses of ultraviolet light from its laser and has also measured light backscattered from air molecules and cloud tops. The measurements show a full orbit around Earth, from the Arctic to the Antarctic, and back. 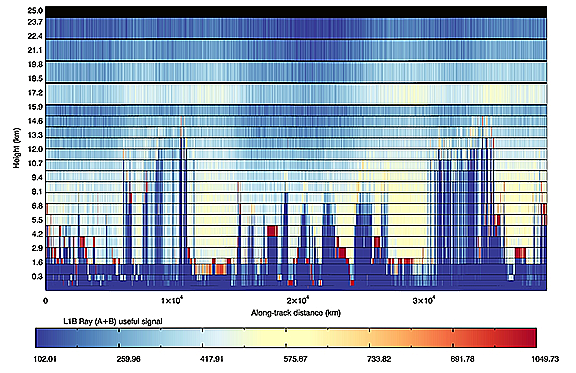 For calibration purposes the signal backscattered from Earth’s surface is used, which is also seen in these results. The image is courtesy of ESA/ECMWF. Launched into space on a Vega rocket from Europe’s Spaceport in French Guiana just two weeks ago, ESA’s Earth Explorer Aeolus satellite has been designed to measure winds around the globe. 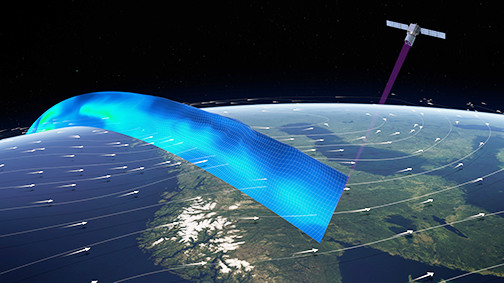 Aeolus will play a key role in our quest to better understand the workings of the atmosphere and, importantly, this novel mission will also improve weather forecasting. Aeolus carries a revolutionary instrument, which comprises a powerful laser, a large telescope and a very sensitive receiver. It works by emitting short, powerful pulses — 50 pulses per second — of ultraviolet light from a laser down into the atmosphere. The instrument then measures the backscattered signals from air molecules, dust particles and water droplets to provide vertical profiles that show the speed of the world’s winds in the lowermost 30 km of the atmosphere. The mission is now being commissioned for service — a phase that lasts about three months. One of the first things on the ‘to do’ list was arguably the one of the most important: turn on the instrument and check that the laser works. With Aeolus instrument healthy and performing well, engineers will continue ticking off other items on the ‘commissioning to do list,’ so that in a few months Aeolus will be ready to deliver essential information to improve our knowledge of atmospheric dynamics, further climate research and improve weather forecasts. The ADM-Aeolus mission will advance our understanding of atmospheric dynamics as well as provide much-needed information to improve weather forecasts. The satellite carries the first wind lidar in space, which can probe the lowermost 30 km of the atmosphere to provide profiles of wind, aerosols and clouds along the satellite’s orbital path. ESA’s Director of Earth Observation Programs, Josef Aschbacher, said that Aeolus is a world premiere. After the launch two weeks ago the whole community has been anxiously awaiting the switch-on of the ultra-violet laser, which is a real technological marvel. This has been successful. New technology has now been pioneered for one of the largest data gaps in meteorology — global wind profiles in cloud-free atmosphere..
ESA’s Fabio Buscaglione, who heads the data processing for Aeolus, said, “The first wind data has already been processed, which is quite remarkable. Michael Rennie from the European Centre for Medium-Range Weather Forecasts, added that at this very early stage in the mission — just three days after the instrument was switched on — Aeolus has already exceeded expectations by delivering data that show clear features of the wind. The instrument is not yet even fully calibrated, so these results are just incredible.